Supplies: 1/2 yard of fabric or scarf. 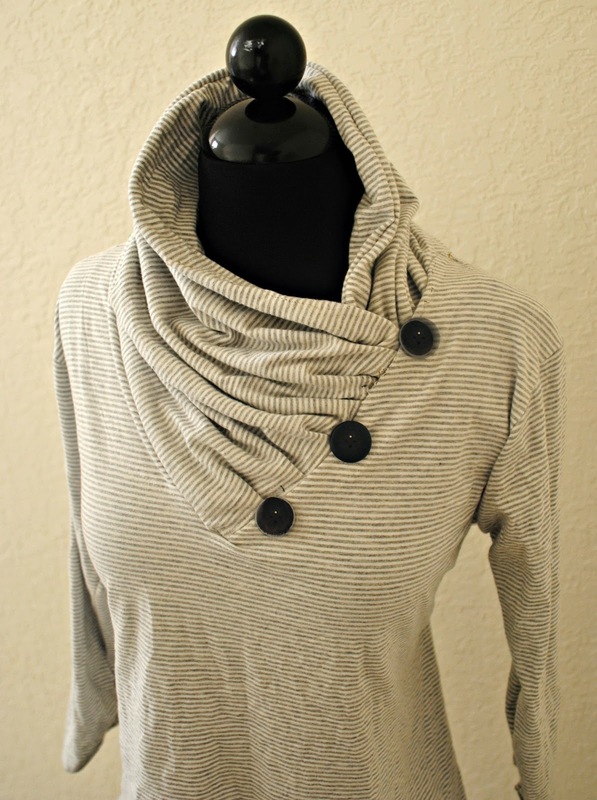 This is an easy DIY to turn a plain v-neck into an interesting cowl collar. 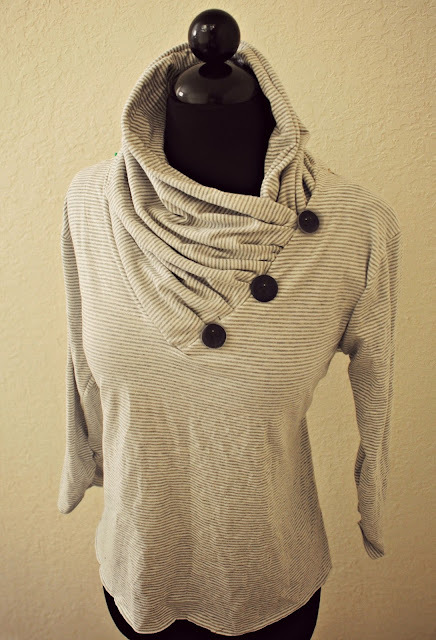 You can use a scarf, fabric, anything that will fit around the neckline. I made a tube by folding a rectangle of fabric that measured 36 by 30 inches. 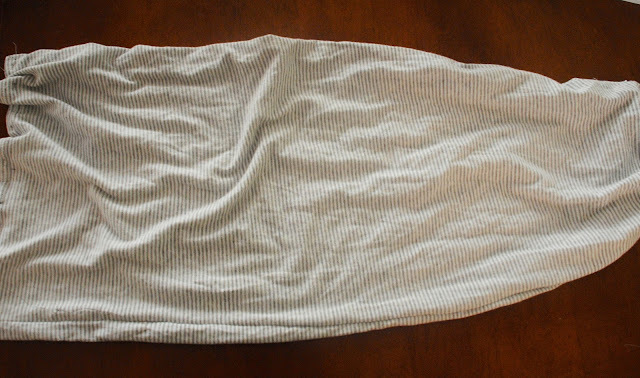 I folded it in half long ways and sewed right sides together, then flipped it out. That way it had a heavier texture and the edges didn't need to be finished. If your using a scarf, fabric, or making a deep v-neck you will need to measure it accordingly. 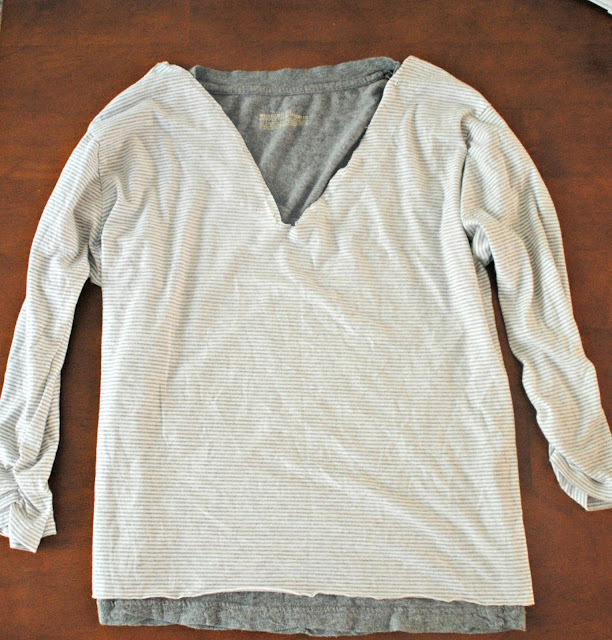 Gather folds with one end of the neck panel starting at the point of the vneck. Leave about 3 inches from the shoulder for the panel to wrap around. 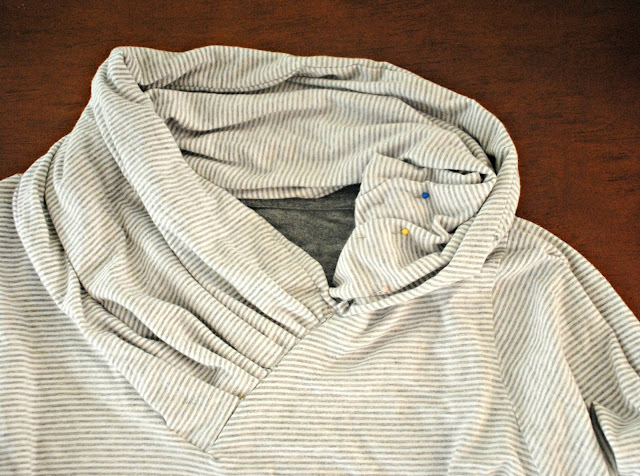 Sew right sides together. 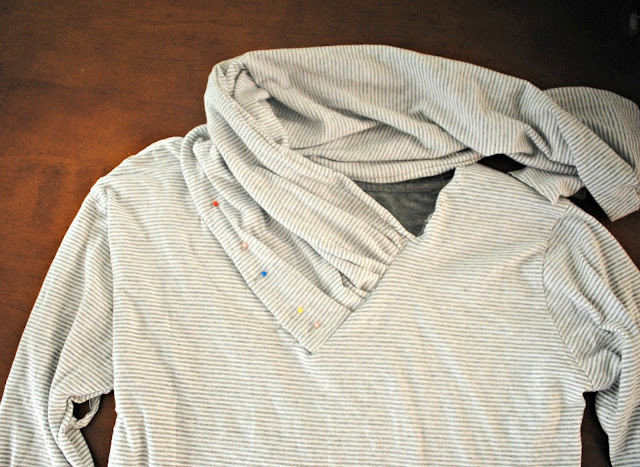 Pin the rest of the neck piece along the vneck and back...Top stitch around or sew right sides together. Gather the rest on the collar overlapping with the front gathers. Sew right sides together...Trim any excess. Oh my. I love that idea. Thanks for the DIY. This is going on my fall must-haves list! this is great! :) is the fabric for the cowl the same as the t-shirt, or do you need extra fabric? Could it be done by buying two of the same t-shirt? Then, use the fabric from the second T? I love it. Wonderful work. Love this! Pretty cool! Thanks for sharing! I will make one for myself for sure! Will be nice for this cold weather! Can't wait to make one for fall, thanks for sharing it! I'm Obsessed with your blog, just read every post!!! So excited to be following you. How lovely, thank you for the tutorial I'd love to give this a go. I am loving this!! Silly question tho.... How did you get fabric to match so perfectly? I was actually wondering the same thing. Saw this on pinterest and had to come check it out! I love it! I'm definitely going to do this. This is really cool, I'm scheming up some sort of twist on a cowl myself. Love your blog! Can't wait to see more! What are your guidelines foe measurements? Looks like Length of tube needs to from point of V up onside to shoulder and across neckline (plus seam allowance) Width is opposite Shoulder to V ( which is actually doubled by 2 ends of the tube which would provide gathering) Does that make sense and sound right? This is great and I really like it! 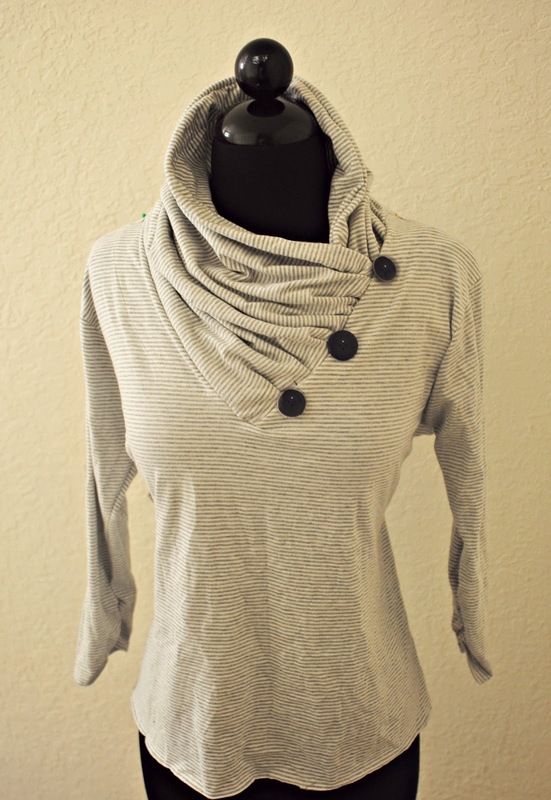 I've been trying to figure out some variation on a cowl neck that is more interesting than the usual, but you've beat me to it! I'm definitely making one of these! Wow, so happy to have found this. Your idea just pushed itself into the middle of my "Must Make In December" pile! It looks so cosy and comfortable: just what I need for the winter ahead. OMG this is genius! Thanks you so much for showing us how you did it!! Just love it! Oh WOW, so nice, thank you for this great idea!!!!!! Oh, I cannot wait to try this out! Love this idea, thanks so much for sharing! Saw this on pinterest as well! Definitely trying this one, thanks for sharing! Do you have a YouTube Channel Im better at seeing things like this??? Hi! This is so cool...I am seeing 2 shirts here. Are you using the grey tee as a base or is that the inside of the tee/fabric? Great tutorial! I was wondering this, too. Is the grey shirt sewn into the cowl neck and part of the new shirt or is it just used as a gauge for to create the v-neck? Thanks! Hi! Dumb question, but is a sewing machine required for this project? I don't have access to one and would still love to to this...Thank you! Hi! Is a sewing machine required for this project? I don't have access to one and would still love to do this...Thank you! I love it. This is such a great way to jazz-up a plain shirt. Can't wait to give it a try. This is such a cute idea! I can't wait to try it out myself. WONDERFUL IDEA! THANKS FOR SHARING. THIS A MUST TRY. Love it, gonna try it on a shirt for my husband, he likes unusual collar treatments. Love this! Think I will try it on shirt for my husband, he likes unusual collar treatments. This is soo cute. Have you ever thought about selling them? I would buy one from you in a heartbeat!!! How much fabric do you need for the cowl? I am confused. At the top it says 1/2 yard. A little farther down, it says a 30" by 36" piece. if you want to double it up then do the 36 x 30 inches. If you choose to not have it double sided then just do a half a yard. This is great! I made a collage of the photos for my pinterest. I pinned it ages ago, and just now perusing my blogs found it again as I was consideringtaking up sewing again. 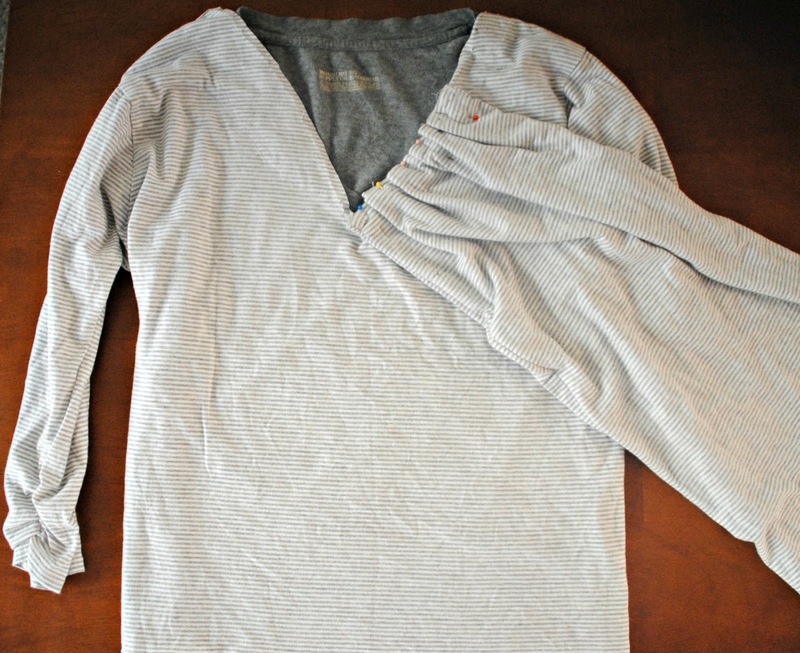 As I am autistic and have sensory issues, I can even incorporate the step of lowering the original neckline in the beg, thus removing the label and making it more comfortable for me to wear! I think I'm gonna buy two shirts on clearance to make this. I love it, making it tomorrow. The cool temperatures have arrived and I'm ready for this comfy project. This is so cool I can't handle it. Headed to my closet to cut some stuff up. I have a couple of tunics that I have not worn for a year because the necks are too open; I need a way to gather the necks in that looks finished yet comfortably loose. THANKS! I'm trying this one! So cleaver .....tks!!!! Can't wait to try it.